Many favorite Greek pitakia (small filled pies) are made in triangles, including tyropitakia, a delicious cheese pie, and hortopitakia, made with greens and herbs. Follow these photos through the folding process. 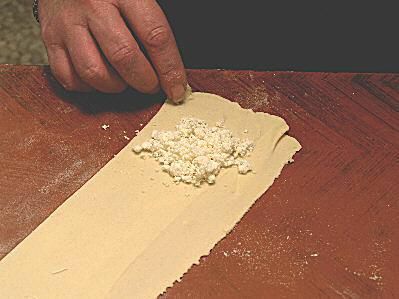 Start with commercial phyllo that has been defrosted, and cut with a sharp knife or scissors into strips about 3 inches wide and 12-18 inches long - and use your favorite filling. These pies are generally baked (but can be fried), so follow recipe directions about brushing the phyllo with butter or oil before folding. Note: In these photos, I'm using homemade phyllo, but achieving the necessary thinness is difficult, so commercial phyllo for pastries might be a better choice.